The Honolulu City Council gave the green light Wednesday for police to start citing people for “lodging” on public property or blocking sidewalks across Oahu. Now the question is whether that’s legal in light of a recent federal court ruling. 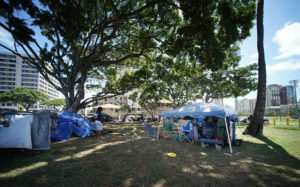 The council gave final approval to Mayor Kirk Caldwell’s proposals to prod homeless people into shelters … Continue reading Islandwide Homeless Restrictions Approved — But Are They Legal?